Ever wonder what an eclipse would look like from the Moon? Well now you can know, because JAXA's Kaguya spacecraft has taken a picture of one. 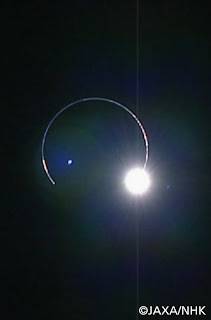 Taken on February 10, 2009, this image shows Earth eclipsing the Sun, as viewed from Lunar orbit. This is the first ever picture of a solar eclipse from the Moon. Actually organized and also beneficial details. And also almost everything will be apparent, thank you. My partner and I seemed by means of several content and also need to point out, they may be extremely intriguing. Today just click here payday loans spring-valley All the best.